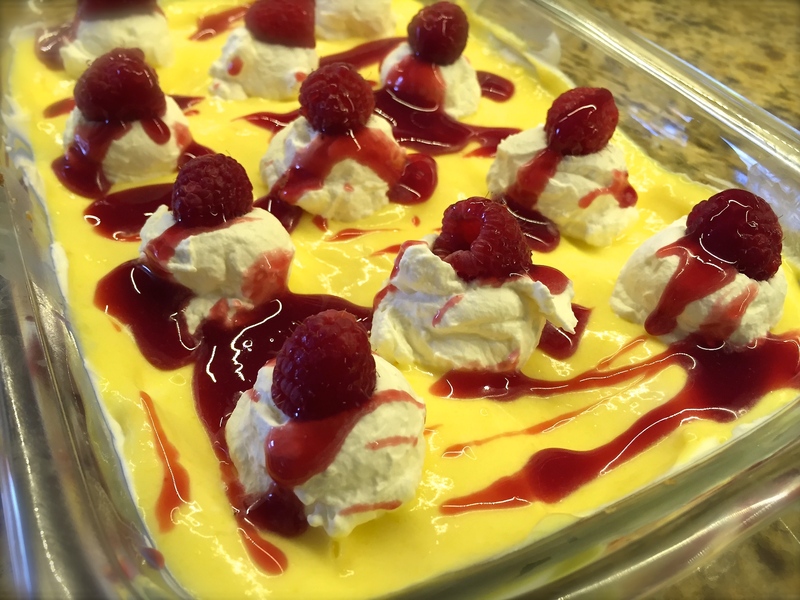 Here is another mouth-watering, jaw-dropping, Trim Healthy Mama dessert brought to you from the kitchen of Charlene Waldner! Its layers are light, refreshing and so pretty! The extra layers may take a bit more time but it is worth every minute! Charlene let me in on one of her secrets… and I’m gonna just blast it here to the blogging world! =) Haha. “The trick to making THM desserts without having the after taste that some healthy sweeteners bring, is to mix sweeteners! For example, in my Lemon Curd, rather than only using stevia, mix in some xylitol too. It makes the world of the difference and many people can not tell that it was made with healthy sweeteners!” I think this trick alone will revolutionize my THM baking! =) Thank you Charlene! I cannot stop looking at these pictures… so pretty! In small saucepan over medium heat, melt butter and honey. Remove from heat and add remaining ingredients. Press into 9×13 pan and bake for 10-12 min. Cool. Meanwhile, make lemon curd. Place lemon juice, egg yolks, sweetener, and salt in saucepan and place over medium heat. Cook until thickened, whisking constantly. Remove from heat and add butter. Cover with plastic wrap and cool in fridge. Whip cream cheese until smooth, add whipping cream. Beat until fluffy. Add vanilla and sweetener to taste, stir until combined. Place in small saucepan. Simmer 10-15 min. Strain and discard seeds. Put back into pot and bring to boil. Add 1 1/2 tsp Glucomannan and 1 tsp unflavored gelatin. Remove from heat and sweeten to taste. (stevia, xylitol, or erythritol) Cool. And let the layering fun begin! Spread the cream cheese layer on cooled crust. Cover with lemon filling. Cover and keep refrigerated until serving. 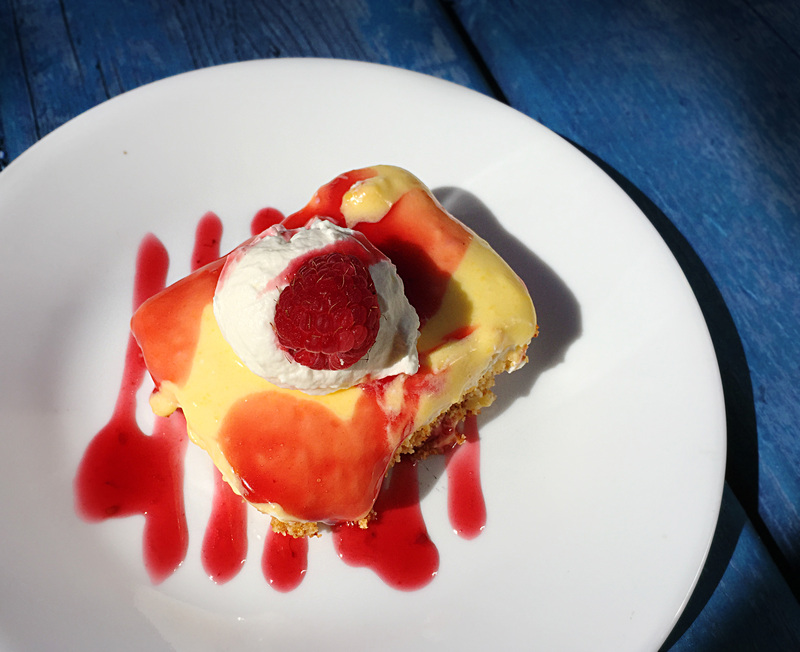 Before serving, garnish with piles of whipped cream, raspberry sauce and fresh raspberries! Mmmmm… Lemon is my favorite! I should try this! Yes you should! =) If you know Charlene, you know she makes nothing but the best!